I found a tag, ’42″x36″, type 140, Debutante by Dan River’ on the inside of the pillow case that I’m taking to class tomorrow & googled it. In 1961, The Torrence Herald advertised a pair of these pillow cases same size as mine but not ‘Debutante’ on sale 2 for $0.76 & the ‘Debutante’ that they did advertise are not the same size on sale 2 for $1.26. So, close but not a match. I also found a pair with embroidery edging by Dan River that are close to mine but not an exact match, on eBay for $3.99 + S&H. A pair that isn’t opened is selling on eBay for $19.99. Understandable difference in price. Since our next wedding anniversary will be our 25th, I decided to take one of my (our) favorite photos from the wedding album & use it for this project. I scanned the photo into the computer and enlarged it. I made 3 attempts at tracing it until I got this one. 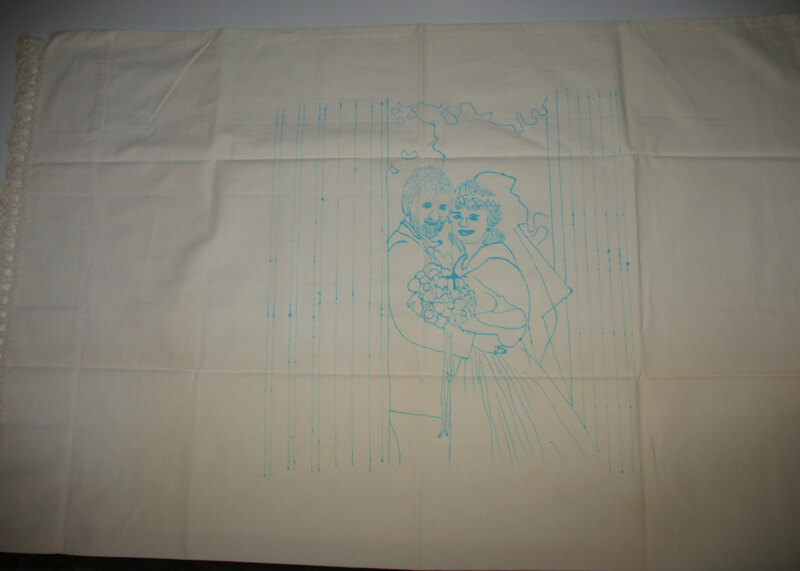 Then, I traced it onto my pillow case which is larger than I expected it to be back in my grandmother’s day. It measures 30″ x 20″. I’m glad it was that big though because I was able to slip it over my light box & just trace through the one layer. Well, I missed the mark on the this project because I didn’t start with the right subject. And, I stitched in a classic embroidery style. So, I’m glad to get a second chance at an Oct 22 class at Rittenhouse Needlepoint. Here’s the concept for the first class I took a few months ago with Joetta Maue – Glean from daily observation to create a one of a kind personal artwork by creating a visual “diary sampler” of embroidery stitches, incorporating abstraction and pattern or confessional writing and images. 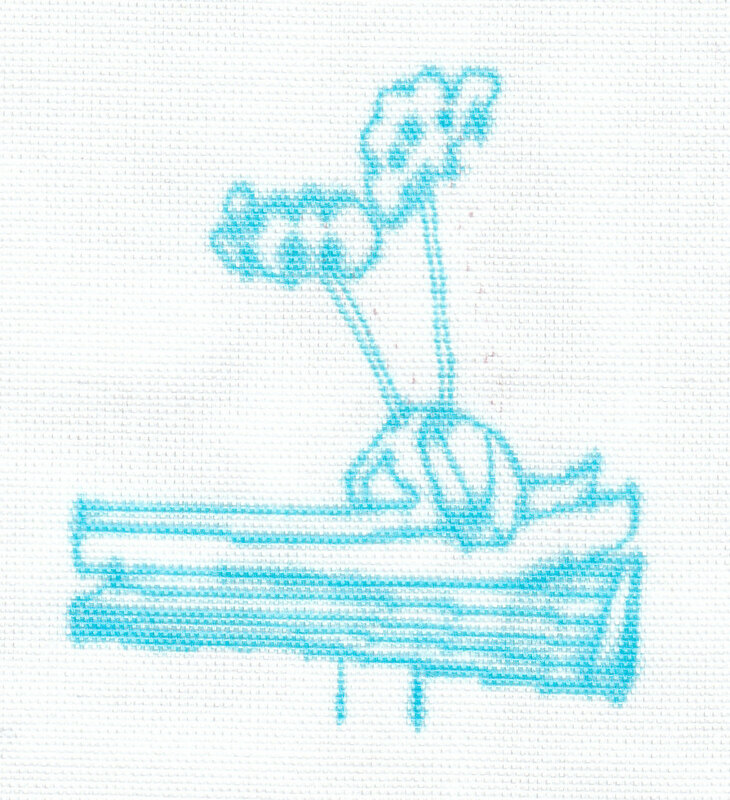 The “diary” of stitches will be explored as a daily act and observation. We will discuss the creative use of diaristic writing and daily life documentation, while looking at examples of contemporary fiber artists. It was supposed to be more ‘Autobiographical Embroidery’. 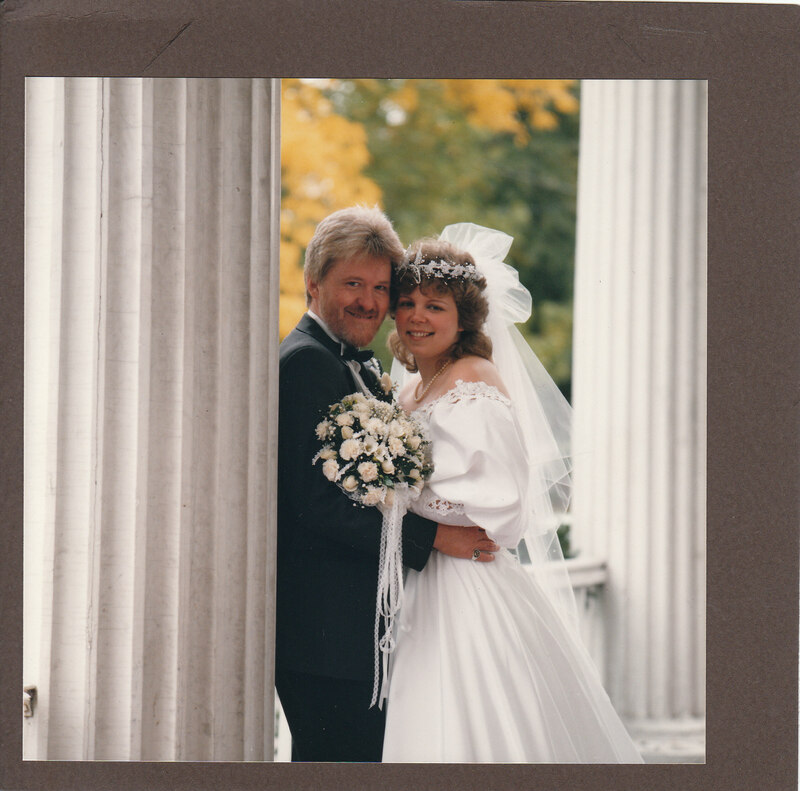 I don’t know what photo to take for the second class but I’m thinking about a photo from our wedding because we are celebrating 25 years of marriage next year! At least that is more in keeping with the concept. Although her concepts aren’t complicated, the class at Rittenhouse Needlepoint with Joetta Maue was way too short! At least 4 hours were needed to really pick her brain. But, we reviewed her & some other’s styles of embroidery. Reviewed how to transfer a photo using a light box, a window, and a projector. She traces the important lines – not all the details. I own a lightbox (got it with a 40% coupon at AC Moore/Michael’s) for about $50. And, I found a projector like she used online for $60 at www.nextag.com/Artograph-Tracer-Projector-581432582/prices-html. We used a water-soluble marker to trace & the ink came right out with water. I know because when I came home I washed my first tracing out & redid it. I needed a smaller tracing because I just don’t have time to do a large piece. Then, we reviewed her basic stitches: split stitch, back stitch, & satin. Be creative is her only guideline! She stitches some fascinating pieces on antiques linens (http://www.joettamaue.com/ & http://littleyellowbirds.blogspot.com/). I’ll be interested in seeing how mine turns out! 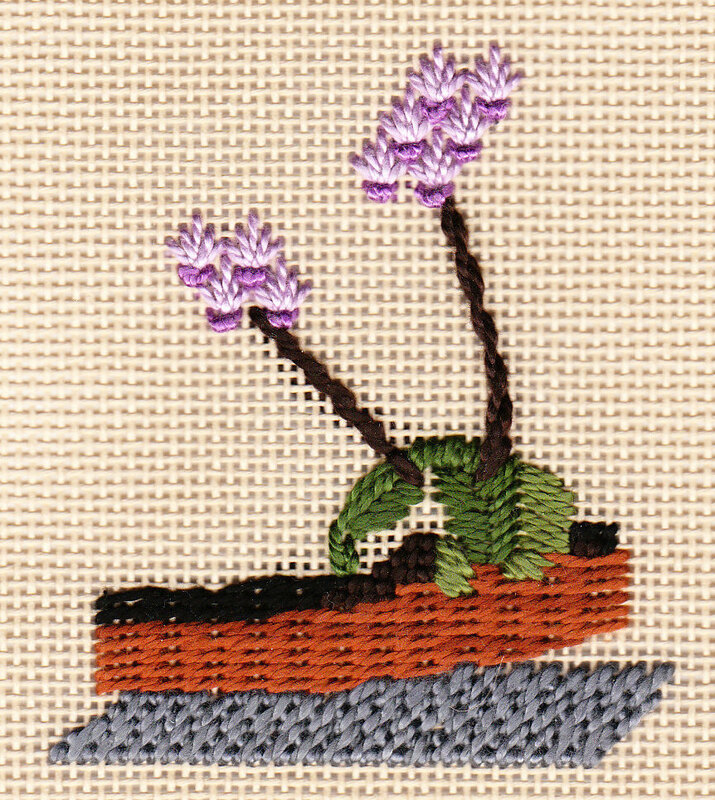 I decided to stitch the orchids again (https://melitastitches4fun.wordpress.com/2010/03/08/orchids/) for today’s class. 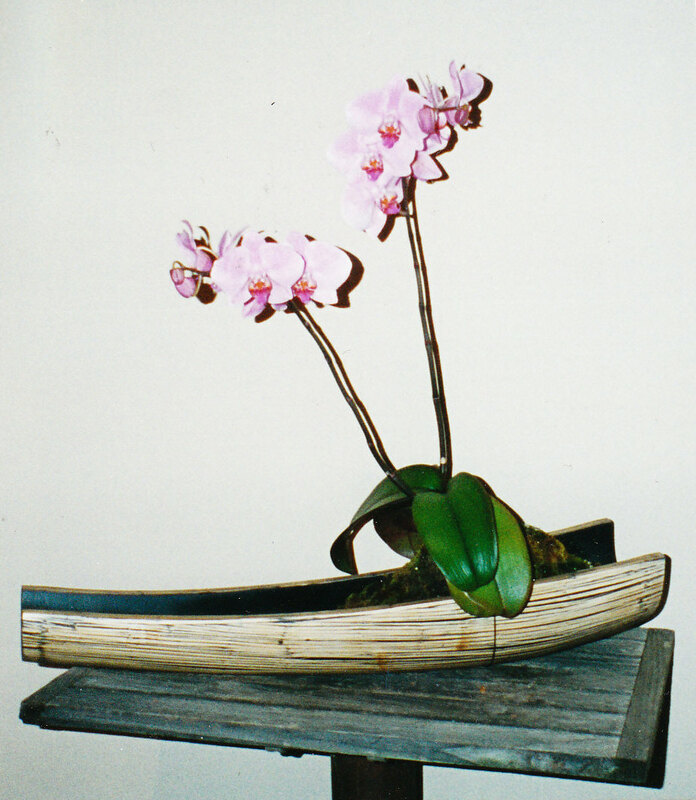 It isn’t a large piece or complicated by a lot of colors & I know it can be done much better. This will be different as well because it is embroidery. But, I expect the concepts to translate to needlepoint. I’m looking forward to a photo embroidery class with Joetta Maue at Rittenhouse Needlepoint on July 16. 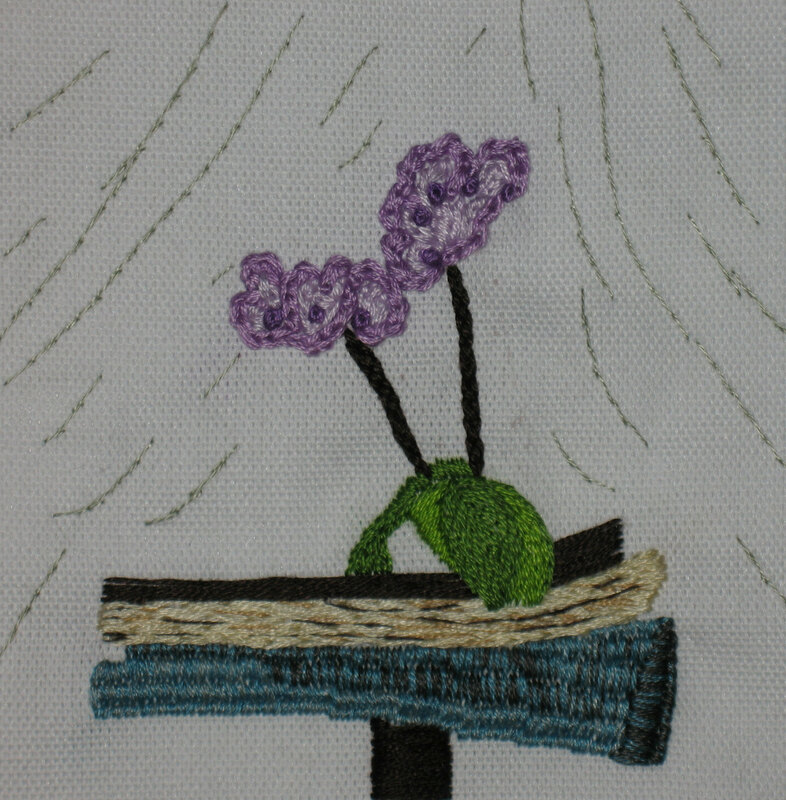 Joetta is an artist (http://www.joettamaue.com/index.html) who loves fiber & embroidery among other things. Stephen talked about her work earlier this year (http://rittenhouseneedlepoint.blogspot.com/2011/01/joetta-maue.html). We’ll use our own photo, transcribe it into a drawing, & then stitch it. I have a month to look through my photos to decide what to take. It can’t be very complicated – it is only a 2-hour class. And, I can’t start a huge project anyway. Always fun to learn & get inspired!